Eilaboun is an Arab Palestinian village which is located on the far west of the sea of Galilee, inhabited by Christians and Muslims, its population reaches 5000 and it spreads over 4800 acres. Eilaboun is considered to be a peaceful village. 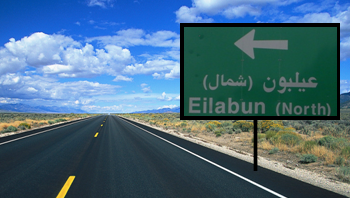 The people of Eilaboun enjoy high standard of civilization in a variety of fields and are open to the outer world in spite of all the difficulties that they face in social and economical areas in addition to lack of local sovereignty over lands needed for normal increase in population. It was occupied on the 30th.10.1948. and it was absolutely a painful day which had the massacre. During the massacre 14 young men were killed in cold blood. Its people were forced to abandon the village on foot towards the north heading to Lebanon which was 150 km away. After 50 days away of homeland people started their return in order to build a new life under the Israeli occupation. Eilaboun village is located on a hill in the eastern part of the lower Galilee, near the west east side of Elbatouf plain which is 9 Km of Golani Junction to the north on road number 806. I am very grateful for everyone who helped me build this site. This site is still in the process of building, so if you have further information or any recommendation, please contact us.